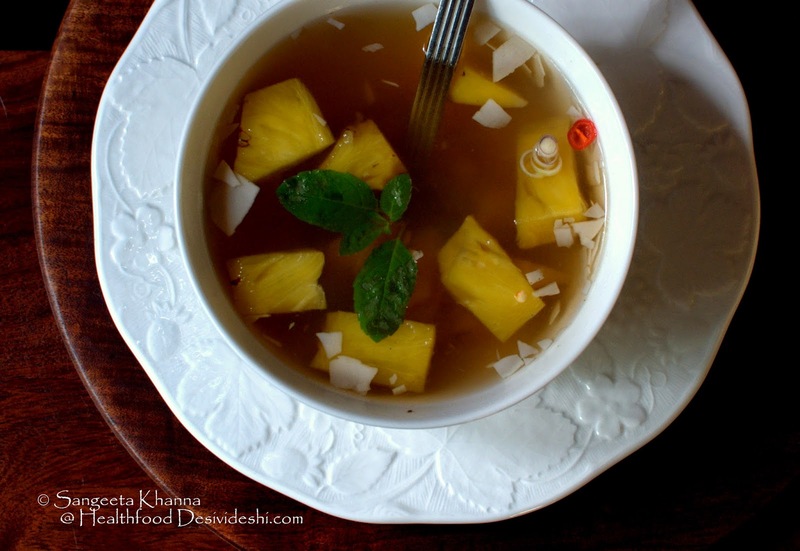 Pineapple soup is a bit uncommon recipe but it is quite a comfort in winter months. Even though this winter we are being cheated here in Delhi as there is no chill in the air even though December has already started, this soup feels really good to wrap my hands around and sip slowly. Warming, healing and refreshing all at the same time. Many people find pineapples itchy in the throat due to hypersensitive throat but cooked pineapple is good for even those, and the inclusion of galangal, lemon grass and pepper makes this pineapple soup really comforting even for the most hypersensitive throat. This Thai food inspired soup is an absolute comfort for me at least. Pineapple is one of those fruits that have so much nutritive value that they can easily be called as super foods. Pineapples are not particularly rich in macro nutrients but the enzymes and micro nutrients found in pineapples are helpful in many ways. Rich in antioxidants and anti inflammatory enzymes, pineapple is an easy fix for post workout electrolyte balance as well as for taking care of the DOMS that happens the next day of an intense workout. This mocktail made with pineapple juice and lemongrass infusion is a great thirst quencher as well as a good electrolyte drink. A smoothie with pineapple, aloe vera and celery sticks is a great detox smoothie that works like a charm after a day of festive indulgence. 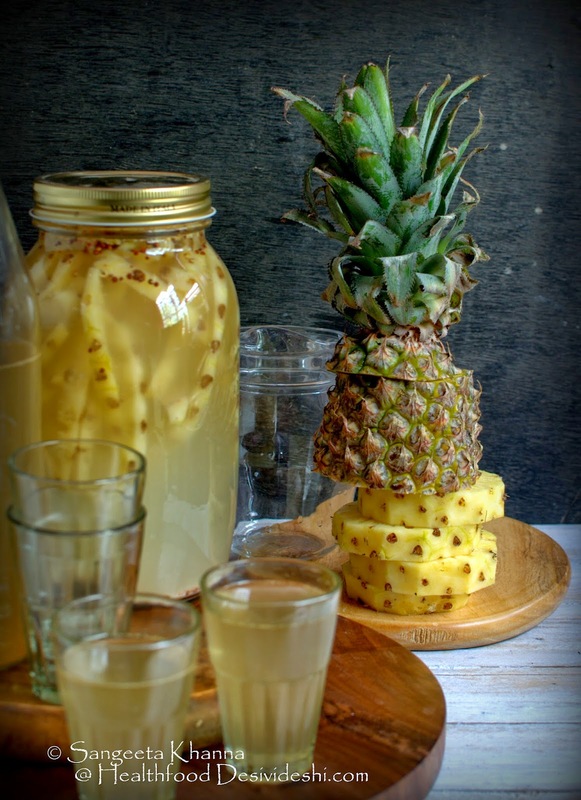 My recipe of pineapple kanji is something I feel really good to develop as t is a great probiotic, anti inflammatory and refreshing drink, all at once. Pineapple salads are my favourite especially after grilling the pineapple pieces and tossing them up with other ingredients being used. Pineapple and paneer salad with herbs and nuts is repeated quite regularly on my dining table. Grilled pineapple and broccoli is another yummy salad that fits the super food definition aptly. Pineapple also goes into my fruity version of insalata caprese. 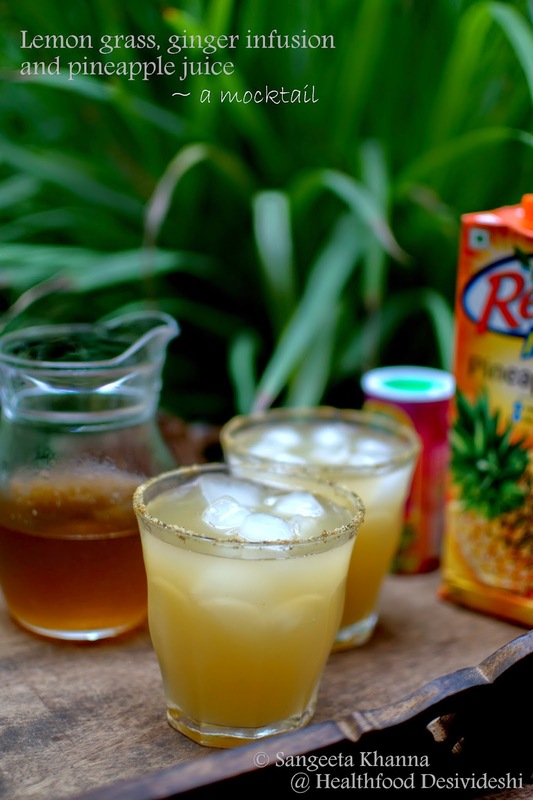 I have come across many recipes of pineapple rasam on the internet and have been meaning to try one of them really soon. But fresh herbs growing in the garden make me think of using them in the best possible way and I come up with my own concoctions. I have a lot of lemongrass and galangal growing in the garden, both being sturdy kept me company even though the oregano, marjoram, rosemary, lemon balm and thyme etc all died upon me due to my frequent travel in the last few months. Lemongrass keeps finding way to my infusions and teas and I often use galangal leaves for some of those infusions as well. Roots of galangal take time to set and one doesn't feel like uprooting them as often. While thinking about an anti inflammatory soup for winters I couldn't stop myself from using galangal and lemongrass once I decided upon pineapple as the base flavour. Add the lemongrass (scissor cut), galangal and tulsi springs to water and simmer for 2-3 minutes. Take off heat and strain. Now add the pineapple pieces, crushed pepper, salt and coconut flakes and simmer for 5 minutes. Add the pineapple juice, bring to a soft boil before finishing. Adjust seasoning, add a little jaggery or lime juice if required as the flavours should slightly hot, sweet and sour. Coconut flakes add a nice bite and subtle flavour to this soup. Serve hot garnished with sliced hot chilly, slices of lemongrass bulb and fresh tulsi leaves. I use pineapple juice from cartons quite often for convenience and also because we do get some good quality juices with no added sugar. Adding some fruit juices to cooking is a fun way to bring more flavours in your food. The quick soup is packed with goodness of tulsi, galangal, lemongrass and pineapple, all ingredients known for their superb anti inflammatory benefits and for enhancing metabolic rate. Aren't we blessed to find such healing food so easily around us? 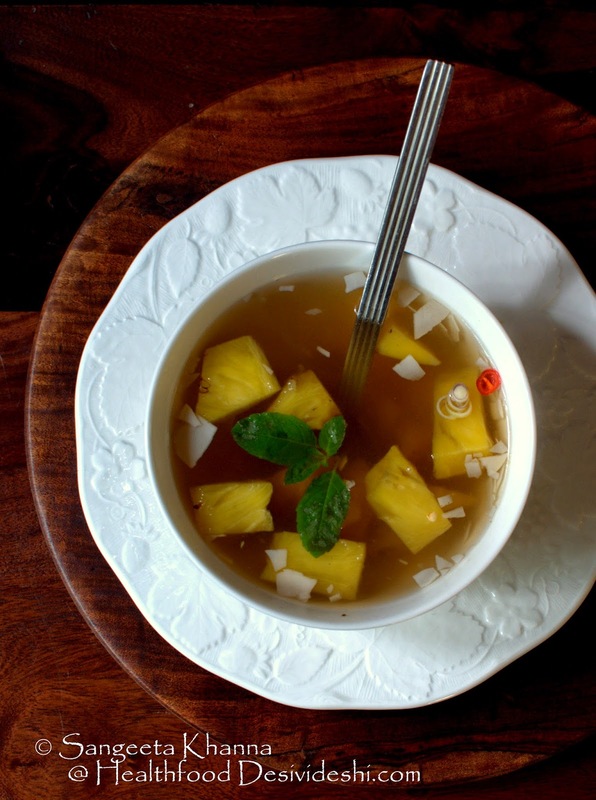 Try this simple pineapple clear soup or add a little coconut milk to make it a little more tropical in flavours. You might like some more chilly heat may be. Play with the flavours as you wish, this pineapple soup wont disappoint you anyway. 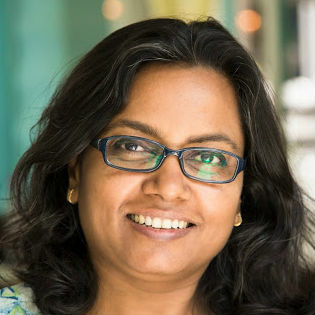 Wow Sangeeta! So many herbs! Please do a post on growing them. To reduce waste I have planted some herbs and greens in ashirvaad atta packets as well as oil pouches. They need less watering and are thriving much better than the ones in lovely terracotta pots that are the pride of West Bengal. I had some awesome fresh pineapple in Mizoram and some from my friends farm in a village near Thiruvananthapuram. They tasted so wonderful that the very mention of pineapples brings back happy memories. Yes the pineapples from north east are the best. Never had any from the southern states but fresh fruits from their place of origin are in their best taste and flavour.